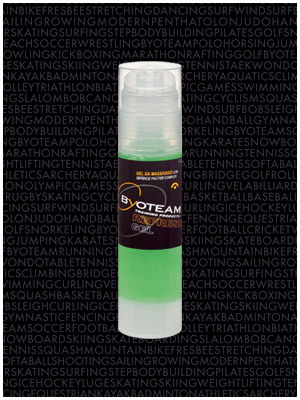 Refreshing gel for relieving muscular pains, swelling and fatigue. The gradual-release micro-spheres of Menthol provide a feeling of freshness and relief. Enriched with Sunflower extract with its antioxidant and anti-inflammatory properties, the gel is easily absorbed, is not greasy, and softens and protects the skin. Apply the gel directly to the area to be treated and briefly massage. Mountain arnica, Menthol, Sunflower extract, DFC (Vitamin A, Vitamin E, Olive oil, Almond oil, Jojoba oil, Iron, Copper, Zinc, Magnesium).